These pilots will provide critical support to the Loughs Agency in ensuring the sustainability of the native Lough Foyle flat oyster. The SAFER project sits under two departments within Derry City and Strabane District Council, namely tourism and environment. 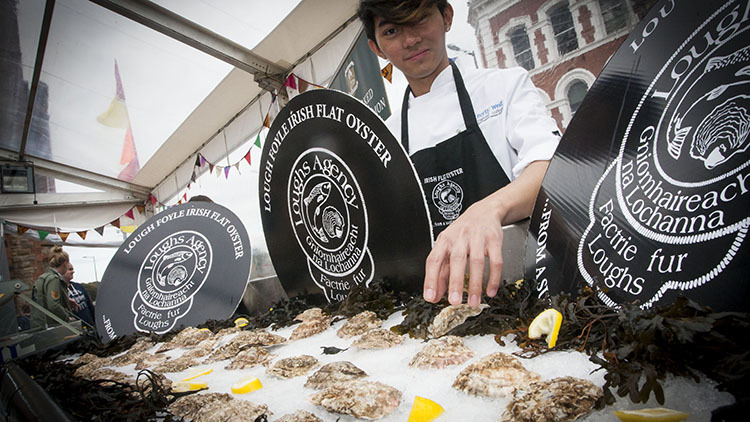 The ambition of the project is to develop the native Lough Foyle oyster which has been identified as a unique selling product for the region. The council is working to develop this from both a sustainability aspect and tourism perspective. As such, they are working closely with stakeholders including the Loughs Agency on the sustainability aspect and also with stakeholders in the food and drink sector locally. Derry City and Strabane District council are progressing two pilots through the SAFER project. One will support development of restoration tanks by the Loughs Agency for the native Lough Foyle oyster to help sustain and grow the natural population. Oyster production in the wild is dependent on many factors and these tanks will provide an optimum environment for the oysters to grow and in turn support sustainability of this hugely important unique selling point for the region. Key to this development is the monitoring and maintenance of optimal conditions of water in the tanks for oyster well-being. The pilot using wireless sensors will enable officers to monitor conditions such as water oxygen levels, chlorophyll and temperature several times a day. To avoid the need for manual testing and measurement which would require several visits a day by staff to remote and difficult to access terrain, a remote system will allow data to be sent back to a remote database which can be accessed from anywhere by staff. The second pilot further supports the sustainability of the Lough Foyle native oyster. This pilot will look at potentially creating a system that could replace the existing system with electronic tagging. Currently Lough Foyle oyster fishermen are issued with pre-authorisation plastic tags which are affixed to bags. This system has been vulnerable to abuse and error. This pilot will replace the electronic tagging system, which allows enforcement officers to scan and read each tagged bag upon landing to ensure fishing quotas are maintained. These pilots will provide critical support to the Loughs Agency in ensuring the sustainability of the native Lough Foyle flat oyster. This is coupled with a new video which will communicate just how special and unique the oyster is to the consumer. SAFER project partners will have the opportunity to visit the site during the third steering committee meeting in May. Learn more about the meeting here.